I am a huge soundtrack fan. I have been since my teens. I've always taken great comfort in listening to expressive music … and have always viewed a powerful soundtrack to be more than just the backing to a moment … but part of that moment … an integral part as important as the acting or the setting. You cannot consider 'Star Wars' or 'Indiana Jones' without John Williams' music. Think 'Jaws' and I just know the music you'll be humming. Hans Zimmer. James Howard Newton. Jerry Goldsmith. Ennio Morricone. All have provided my life with musical accompaniment … and I am richer for it. In fact, I have been known to buy soundtracks … usually from the 'bargain bin' … of films I haven't seen because I loved the work of the composer. I will always see a good soundtrack as more than just the backing for a film … and look at my love of soundtracks as an important building-block for the music I love, promote, and even release on my wee netlabel. It is with this in mind that I approach 'Peripheral: Music for an imaginary film' by Oathless … released on the mighty Hawkmoon Records label. My initial question was, when I began to consume it, was 'Why?' … Why isn't this a soundtrack to a film? It certainly is good enough to accompany a film … not one starring Bruce Willis, mind you … but a film nonetheless. 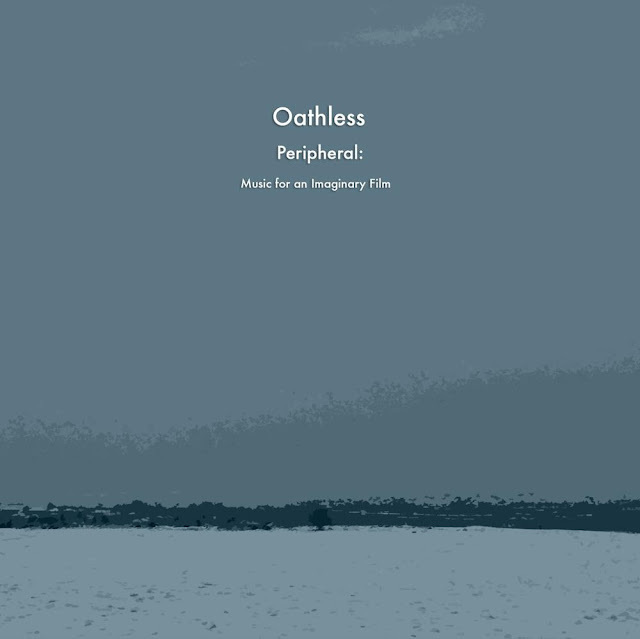 'Peripheral: Music for an imaginary film' by Oathless really does have a wonderfully engaging 'cinematic' quality about it … it could so easily have been a soundtrack. It is testimony to the talent and expertise of Simon Housley, the chap behind Oathless, that I think this. He has created some seriously divine soundscapes … using guitars, keyboards and piano, and programming to make something really beautiful indeed. 'Peripheral' is 58 minutes of sheer, unadulterated beauty … and I, for one, love it. His use of delay and almost 'dubby' effects at the beginning of the album did take a minute or two to get acclimatised to … but the kind of delay Housley utilises really works on this release … it adds to the atmosphere of the first 5 tracks in which it features. He brings an ebb and flow to the music … a rhythmic pattern that engages the listener and draws them into the album. From track 6 - "Intermission II: Veiled" - onwards, however, the album noticeably changes and morphs into something more traditionally 'ambient' in texture. With the delays gone, the tracks have a more pastoral air to them … especially considering Housely's exemplary piano playing and his delicate use of synths to create some utterly delightful atmospheres. Take the 7th track - "The Calm Before The Storm" - for example. This is one gorgeous track: sublime synths underpin a sparse piano melody to create a track Craig Armstrong himself would be extremely proud of. "Skybird" too has a real elegance about it. This, the 8th track, brings a sense of the ebb and flow of earlier pieces (but without the delay) and uses it to amplify atmosphere formed by the synths. It really is an exceptional track. I could easily wax lyrical about the remainder of this release … but I won't. Tracks like the 3rd intermission - "Finding Max" - with its utterly delightful melody and field-recording of falling rain just leave me without words … or the final track - "Coda, for the End of Days" - which is a 10 minute opus of breathtaking beauty. This is an album to be experienced at first hand ... by yourself ... preferably with good headphones. Don't take my word for it ... taste and see for yourself. I highly recommend this release and look forward to more from both Housley and his label - Hawkmoon Records - whose output has been outstanding … theirs is a roster of remarkable talent … a roster in which Housely stands tall and proud.